Casa Mila - La Pedrera. Modernist building in Barcelona designed by Antoni Gaudi. Casa Mila, also commonly known as 'la Pedrera', which means the quarry in the Catalan language, is a unique modernist building in the centre of Barcelona on elegant shopping street Passeig de Gracia. 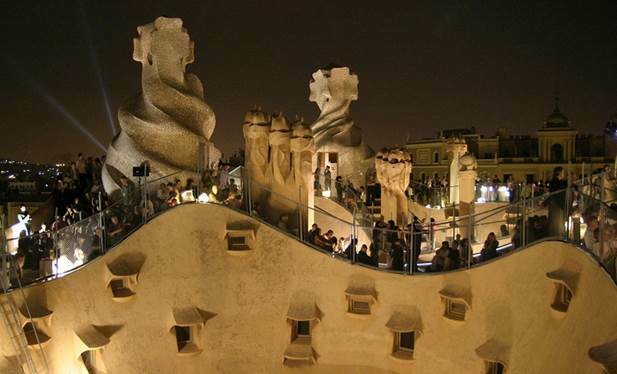 In the summer you can enjoy La Pedrera roof terrace jazz concerts. La Pedrera is also a location in bestselling author Dan Brown's new book 'Origin' released in October 2017. La Pedrera was built between 1906 and 1912 by famous Catalan architect Antoni Gaudí. La Pedrera opened on 29th October 1912. It is one of the most unusual building designs in the world. and during the construction the neighbours tried to have the building work stopped because they feared the controversial design would affect property prices on the fashionable Passeig de Gracia street in Barcelona, where Casa Mila is situated. How wrong the neighbours were. The Casa Mila is now one of the most famous buildings in Spain and in the world. This amazing house was commissioned by Mr. Pere Mila, who was married to a rich widow, Mrs. Roser Segimon. They wanted to live in a spectacular house in the most cosmopolitan avenue of the Barcelona of the time; the Passeig de Gracia. Gaudí was their choice of architect, mainly because he had just built the nearby Casa Batlló building, which was considered the very latest example of the modernist architecture at the time. Mila wanted his house to be even bigger and more monumental than Casa Batllo. The builiding that Gaudi designed for him has become one of the most famous buildings in the world.In 1984 Casa Mila was declared a UNESCO World Heritage site along with other Gaudi buildings in Barcelona. Casa Milà is owned by Fundació Catalunya-La Pedrera. Visitors to La Pedrera can visit the patios, the "Espai Gaudi," which is a tour of the attic and roof-terrace - and visit the "Pedrera apartment." A visit to La Pedrera by day covers two different museum areas – the Espai Gaudí and the Pedrera Apartment – and the Provença and Passeig de Gràcia courtyards, the Exhibition Room and the Roof-Terrace. The Espai Gaudí, is an 800m2 attic with 270 brick arches that give you a feeling of walking inside a whale skeleton. The Pedrera Apartment recreates the home and life of a Barcelona bourgeois family of the first third of the twentieth century. It is also now possible to visit the former residence of the Milà family, which houses the Temporary Exhibition Room. The roof-terrace is equally impressive and is preserved exactly the way that it was built in 1912 with six staircases, two air ventilations towers and seven chimneys each made in a unique style and decorated with trencadís mosaic creations. This amazing house was commissioned by Mr. Pere Mila, who was married to a rich widow, Mrs. Roser Segimon. They wanted to live in a spectacular house in the most cosmopolitan avenue of the Barcelona of the time; the Passeig de Gracia. Gaudí was their choice of architect, mainly because he had just built the nearby Casa Batlló building, which was considered the very latest example of the modernist architecture at the time. Mila wanted his house to be even bigger and more monumental than Casa Batllo. The builiding that Gaudi designed for him has become one of the most famous buildings in the world. This is an spectacular night-time experience which is an unforgettable journey through La Pedrera finishing with a videomapping audiovisual show on the roof-terrace with a glass of cava. If you don't have time for a tour then visit the Cafè de la Pedrera" on the mezzanine floor in a room where you can enjoy a coffee while admiring the lovely modernist ceiling. Monday to Sunday from 09:00 to 18:30. Monday to Sunday from 09:00 to 20:00. La Pedrera Secreta. Casa Mila offers night tours of La Pedrera all week days from 21.30 to midnight with the last tour starting at 22:30. Pre-booking required. Roof terrace jazz and music concerts La Pedrera in summer on Thursday Fridays and Saturdays from end June to beginning September from 9.45pm to 11.45pm. Nits d’estiu a La Pedrera is a series of summer jazz concerts on roof of Casa Mila also called "La Pedrera de nit" on selected Friday and Saturday evenings on the roof terrace of La Pedrera / Casa Mila building in July and August. Tickets include a visit to the Espai Gaudi attic in La Pedrera. You can buy tickets online - or at the ticket office of La Pedrera building.